The Green Mountain Conservancy and the Deer Run Nature Preserve, along with an impressive number of neighbors and community members, have been working with the landowners, Alex and Chris Wilson, the game warden, the Vermont Land Trust, and other organizations to conserve and preserve a 287 acre parcel in the northwest corner of Dummerston. This parcel, a portion of the southern terminus of Putney Mountain, could provide a key linkage between the conserved Putney Mountain ridgeline and large wild areas to the west. With pledged VLT easements from two abutting landowners, (Anthes-Copeland, Farwell) an additional 150 conserved acres will connect this parcel to the West River, a State Priority Aquatic Feature. The land includes a great diversity of terrain, natural communities, flora and fauna, streams and small wetlands. 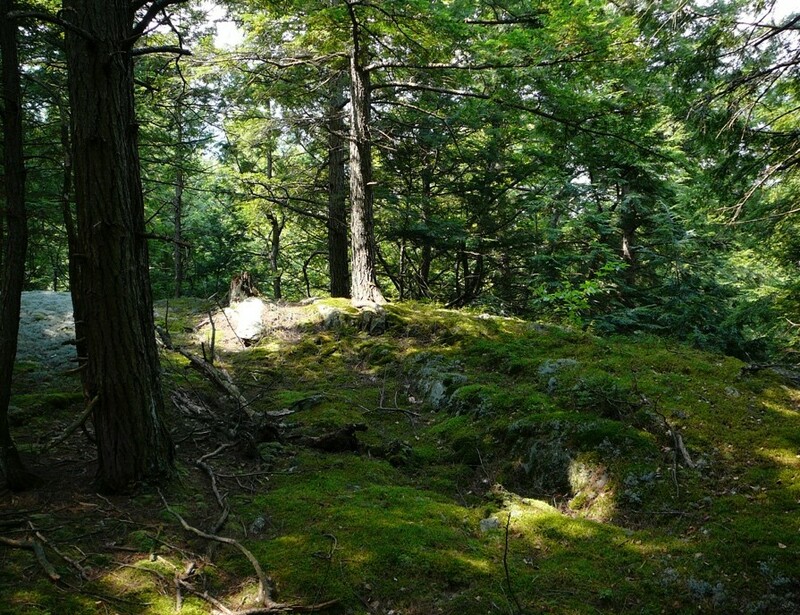 Among the significant natural features are five vernal pools, a deer wintering area, bear-scarred beech trees, and several State listed plants. Two ornithologists conducted a preliminary survey this summer. They identified over 60 species and expect to find at least 30 more in the coming year. While VELCO And Green Mountain power lines cross the property, ecologists who have visited the site have noted the value of the early-successional/shrub-scrub habitat that the powerline provides. Birds that have been declining in Vermont—brown thrasher, field sparrow, prairie warbler, mourning warbler—were among those found in numbers at the site. Bobcat and bear sign abound. A smooth greensnake and Dekay’s brownsnake were found during a quick survey. 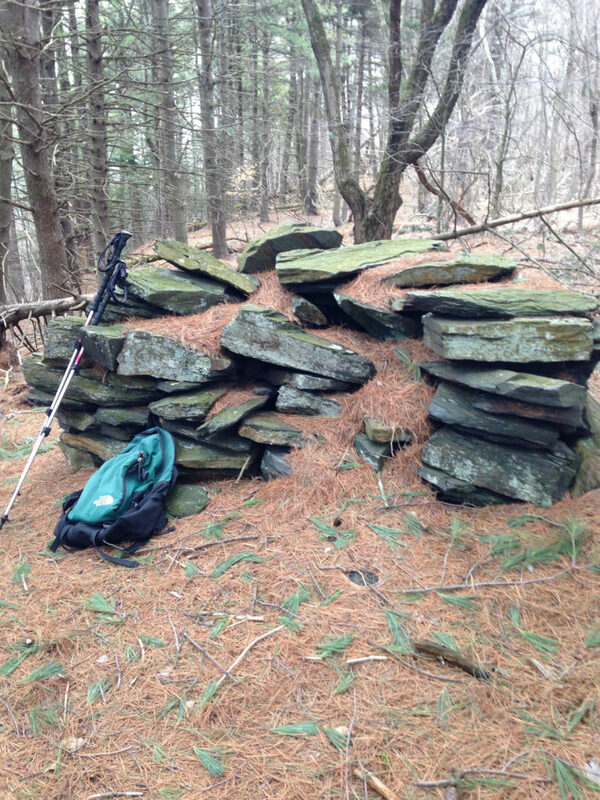 Cultural resources include a dry stone “monument” at the high point (3’x6’x6’ visible), an oval stone pile of interest to the State Archeologist and local Abenaki, a cellar hole and numerous agricultural stone walls. Neighbors have enjoyed hiking and hunting on this property for generations. The sloping hillside provides the much of the view scape seen driving north on Route 30 from the Dummerston Covered Bridge. Neighbors and community members have already invested hundreds of hours of volunteer time in this project, known as the Deer Run Nature Preserve, and are committed to providing on-going stewardship. One person has put in over 100 hours establishing a system of footpaths. He notes that when hiking on the property there is little awareness of the power line but the views from the powerline cut itself are magnificent. Future plans include continuing work with the Putney Mountain Association to connect with their trails, and then on to the Windmill Hill Pinnacle Association trails, with the possibility of a 25 mile trail from the West River to the Pinnacle. 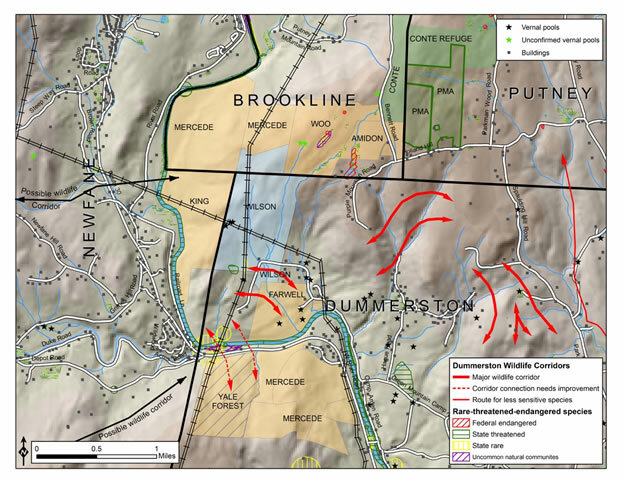 Dummerston has zoned the parcel “Conservation.” The Town Plan calls for “protection and restoration of upland forested areas for flood attenuation and to moderate flooding and fluvial erosion.” The parcel provides water to homes at the end of Camp Arden Rd. The Green Mountain Conservancy (a 501 C3) whose mission is to acquire and protect wilderness lands in southern Vermont, lands that are part of identified wildlife corridor systems, to ensure the continued natural character of these lands, the survival of the plants and animals they support, and to protect their aesthetic, and inspirational values into the future) has a Purchase and Sale Agreement with the owners for $200,000, $20,000 less than the appraised value. While there will be a strong focus on community fundraising to achieve this goal, board members have experience working with various funds and programs and will be making application to several that they have identified as they proceed. They have also discussed the project with Vermont Department of Fish & Wildlife (they will be viewing the property later this month), the Nature Conservancy, and the Northeast Wilderness Trust. Now that there is a purchase and sale agreement, they will begin more focused fundraising, reaching out to foundations and organizations as well as people from the community. The goal is to acquire the land by December of 2019, sooner if possible. The Conservancy is also pursuing acquisition of contiguous parcels of more than 650 acres that include 3.5 miles of undeveloped West River frontage. With the parcel described above and the pledged easements, this would result in a conservation area of over 1,200 acres. create opportunities for people to develop a deeper appreciation of the natural world. The Deer Run Nature Preserve is dedicated to conserving large parcels of contiguous land that are ecologically important: first in northwestern Dummerston and southern Brookline; and later, exploring expansion into lands of special interest from eastern Windham County into the Green Mountains. As Vermont annually loses 11,000 acres of forest and field to development, we seek to conserve the current large undeveloped blocks of land that are recognized by the Vermont Department of Fish and Wildlife as wildlife corridors and priority for rare species that are threatened by this development. Land records in Dummerston show a continuing pattern of land subdivision and development with fewer designated “large parcels”. Once parcels are subdivided and houses built, we lose the large blocks permanently. We feel a sense of urgency to act now to capture the available parcels to conserve them forever—for the wildlife, for the threatened species, for the watershed quality, and for ourselves. Key to this endeavor is public support. We want native species to thrive, and we recognize that people play a vital role in making this happen. To maintain on-going community support, we plan to develop footpaths into this rich forest area and to sponsor educational programs and activities that increase public appreciation of this vital natural resource. The project will begin with the purchase of the approximately 300-acre Wilson property, located in the northwestern corner of Dummerston and southern Brookline. This property descends steeply from the western ridge of Putney Mountain down towards the West River. South and west of the Wilson property there are contiguous undeveloped lands that border the West River. Conservation of the Wilson property will open the possibility of a trail from the West River to the southern Windmill Hill Ridge and then on to the northern end of Windmill Hill Ridge. Over time, Deer Run Nature Preserve will explore the feasibility of conserving properties that would keep intact wildlife corridors from the Connecticut River to the Green Mountain National Forest. The Deer Run Nature Preserve is a project of the 501 c (3) non-profit Green Mountain Conservancy. The Deer Run Nature Preserve will raise funds for the acquisition, conservation, and accompanying costs of the Wilson property. Once purchased, the land will be held by the Green Mountain Nature Conservancy, and managed and maintained by the Deer Run Nature Preserve. There will be conservation easement on the property. There is a Deer Run Nature Preserve governing committee. Four members of this governing committee serve on the Green Mountain Conservancy Board of Trustees. In addition to the governing committee, there is an informal group of contiguous land owners, neighbors and other interested people (public officials, representatives of environmental groups) who meet at least quarterly to provide stewardship, plan and implement fundraising and educational activities, and make recommendations to the governing committee. Initial tasks of the Deer Run Nature Preserve will include fundraising and a biodiversity inventory of the land. Management plans will be developed with assistance from ecologists and conservationists to insure the protection of the landscape, the watershed and resident species. Deer Run Nature Preserve will partner with individuals and organizations to achieve mutual goals and further land conservation efforts. Educational programs and guided hikes on the land may be sponsored by the Green Mountain Conservancy, the Deer Run Nature Preserve and other organizations.